The arrests came as fast as drops of monsoon rain. On Feb. 22, more than 100 Indonesian special police raided a terrorist training camp deep in the jungles of Sumatra island. Within days they captured 14 suspected Islamic militants from a shadowy group called al-Qaeda in Aceh that was believed to have been planning an imminent attack. Then, on March 9, the police converged on an Internet café near the Indonesian capital Jakarta and engaged in a firefight that killed Dulmatin, an Afghan-trained explosives expert with a U.S.-designated $10 million bounty on his head. Among other attacks, Dulmatin was thought to have masterminded the blasts that struck two nightclubs on the vacation island of Bali in 2002, leaving 202 people dead, mostly foreigners. By April 12, the police dragnet had nabbed 10 more extremists, including a suspect in the 2004 bombing of the Australian embassy in Jakarta. Another fanatic, who allegedly decapitated three Christian schoolgirls back in 2005, died in another shoot-out. All told, 48 suspected terrorists were caught within a seven-week period and another eight killed. In May, a further 16 suspects were arrested and five killed as police foiled a plot to assassinate Indonesia's President and visiting foreign dignitaries. Detachment 88 had done it again. Indonesia is waging one of the world's most determined campaigns against terrorism  and much of the credit goes to the country's American-trained police unit Detachment 88. The horror and audacity of the Bali bombings proved to be an epiphany for Indonesians, alerting them to the homegrown extremists in their midst and helping forge a national consensus against terrorism. The following year, Detachment 88 was set up with the backing of the U.S. and Australian governments; today, it numbers 400 personnel drawn from the elite of the Indonesian police's special-operations forces  and it has built up an extensive intelligence network to nab terrorists. Undercover operations in which agents pose as itinerant noodle vendors or new members of a Muslim prayer group enable Detachment 88 to track extremists and convince some to inform on others. Once top militants are located, explosives specialists, snipers, forensics teams and surveillance experts take position. 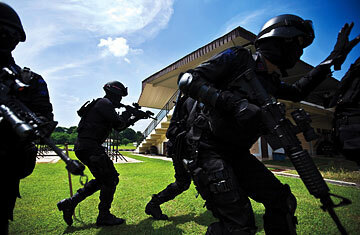 "I've trained guys all over the world, and this unit is one of the best I've ever seen," says one former trainer of the Indonesian counterterrorism squad. But Detachment 88 is more than a shooting machine. In the world's most populous Muslim-majority nation, cracking down on terrorism isn't just about cracking heads. Through deradicalization programs, Detachment 88 agents take on the role of spiritual counselors, working to convince militants of the error of their ways. Some convicted terrorists now cooperate with the police in community outreach programs. "You want to know why Indonesia has done well fighting terrorism?" says psychologist Sarlito Wirawan Sarwono, who instructs Detachment 88 officers in interrogation tactics. "We have no Guantánamo prisons. Our police understand the terrorists' psyches. Other countries can learn from what we do." A nation of 17,000 islands spread across more than 5,000 km, Indonesia might seem too sprawling, messy and diverse to efficiently combat terrorism. While its 210 million Muslim faithful are overwhelmingly moderate, a small band of radicals is calling for Indonesia to abandon its secular underpinnings for an Islamic state. Chief among them are members of Jemaah Islamiah (JI), the militant group blamed for the 2002 Bali bombings, among other attacks. JI and other splinter factions were formed by Indonesians with battlefront experience in Afghanistan and the insurgent-wracked southern Philippines. Most Indonesians display little of the reflexive anti-American sentiment common in a country like Pakistan  witness the suspected role of the Taliban in the failed Times Square car-bomb plot. But the Indonesian mercenaries returned home believing that the West, and the U.S. in particular, was the root of all evil. The fact that Indonesia is neither at war with its neighbors nor harboring a persecuted Muslim minority makes little difference to these hard-liners. "They preach that Indonesians have forgotten the core of Islam," says Noor Huda Ismail, founder of the Institute of International Peace Building in Jakarta, which aims to deradicalize former terrorism inmates. "Their message is simple: the only way for Indonesians to prove themselves as good Muslims is through jihad against the infidel Americans and their allies." In 1998, Indonesians overthrew a dictator who had ruled for 32 years and ushered in a democratic government. It is precisely the nation's status as the world's third-largest democracy that has fueled Detachment 88's success. Wary of the military, which enabled strongman Suharto for so many years, Indonesia's parliament gave the police responsibility for the nation's antiterrorism effort. Instead of imposing an internal security act or other draconian laws that carried the whiff of dictatorship, Indonesia's newly democratic leaders decided to prosecute terrorists publicly through the normal court system. That meant no indefinite detentions that could nurture further radicalization. And to placate an increasingly vocal Islamic political movement, the government took the most controversial stance of all: to consider terrorists not as intractable criminals but ideologically confused souls. "It is Detachment 88's policy that suspected terrorists be treated as good men gone astray," says Sidney Jones, an expert on Indonesian terror with the International Crisis Group, a global conflict watchdog. "When they are fully in police custody, suspects are treated with kid gloves in order to get information on the terror network." During interrogation sessions, Detachment 88 officers, the majority of whom are Muslim, allow prisoners to worship, often joining them in prayer. Little tricks, like greeting inmates in Arabic instead of Indonesian, help convince terrorists that the police are not infidels, as they have been brainwashed to believe by radical clerics. On occasion, Muslims with impeccable religious credentials are brought in by Detachment 88 to discuss Koranic theology with inmates. "Many of the terrorists have been taught just a few verses from the Koran that focus on jihad without knowing the context of these passages," says Muchlis Hanafi, an Indonesian with a Ph.D. in Islamic studies from Cairo's renowned Al-Azhar University who last year counseled former JI commanders. The careful handling has paid off. Of the 400-plus terrorism suspects in custody, the Indonesian police estimate that around half have either cooperated with police or renounced violence. Sometimes even the simplest incentives work. Those who cooperate with Detachment 88 officers have had their children's tuition, their wives' employment and even their prison weddings paid for by the government. See pictures of jihad rehab camp. Read "What's Holding Indonesia Back?"